Now we have some skills and endorsements, what next? Well a great, little used feature of Linkedin is the ability to move the different sections of your profile page around. If you want to make your new endorsements more visible, simply click on ‘Edit Profile’ which you can find on the ‘Profile’ menu. Once here simply hover over the section header, as in the image below, and the cursor will change to a cross shaped arrow. 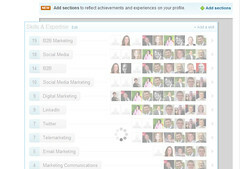 Drag the ‘Skills & Expertise’ section to the top of your profile and then everyone who visits your profile can revel in your skills and expertise face mountain. Can I remove some endorsements from my profile? Linkedin thought of that too. 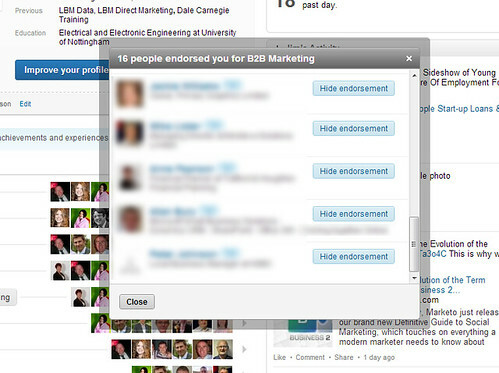 The good news is that like Recommendations, Linkedin have added the ability to hide specific endorsements. This means that you can always change them once you have been given them. In a scenario where you are looking at a new role with specific skill requirements, this could be very powerful for showing your specialism. It is also handy for removing morris dancing or cheese rolling from your skills platoon. All in all, Linkedin Endorsements are a great new feature for building your personal and business reputation. It has some flaws, but using this guide, hopefully, you can make this work for you. Many people feel a little uncomfortable asking for full recommendations, so this could provide a much simpler and easier way to enhance your profile. If you have any questions or want to learn more, contact us by filling in the form at the side. We teach this stuff to businesses all the time.